For the first time since 2003, Roger Federer was placed on Court 1 instead of Centre Court for his first round match at the 2012 championships, Wimbledon. It was no matter for the Swiss maestro, who ripped Albert Ramos in a dominant performance to open his quest for a record tying 7th Wimbledon and 17th grand slam. In just 1 hour 19 minutes, Federer was into the second round, 6-1 6-1 6-1; his easiest first round win in 14 appearances. 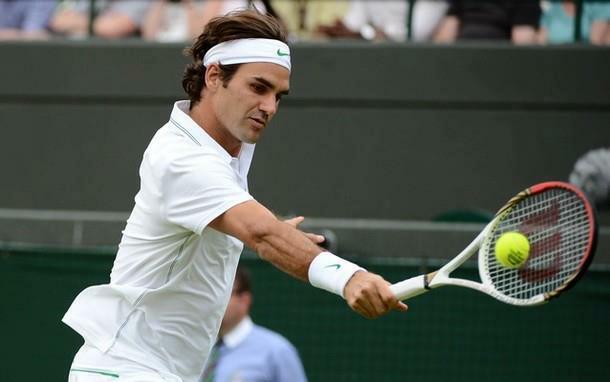 The Swiss maestro is now just the 7th player with 60 wins at Wimbledon. An exquisite performance from start to finish, Federer was aggressive on finishing points at the net and in return games as well. Except for one slip of his service game, the Swiss star was routinely breaking serve, eight times out of ten chances to be exact. The fourth game of the third set showed the pressure Federer was putting on Ramos, as the Spaniard had multiple chances to hold serve but the Swiss simply refused to let up, reminiscent last in the epic semifinal vs Djokovic at Roland Garros last year. Just weeks ago Federer struggled in his early round matches at Roland Garros, and it set the tone for his erroneous play the entire tournament. He will be hoping for much better play to continue when he takes on Fabio Fognini in the second round Wednesday. After the match, Federer spoke about serving and volleying more while having a comfortable lead throughout the match. The Swiss believes this style of play could be a difference maker in getting through pressure-filled situations further down the road. In his 14th consecutive appearance at Wimbledon, the Swiss maestro talked about his appreciation for the unique atmosphere at the All England Club. The feeling is same at age 30 as it was for him at age 17. “You do realise the moment you walk onto the court that it is a different place here than any other,” Federer said. “Just the respectful clap, and no music. The whole thing is very much focussed on the players and on the sport, which is beautiful.